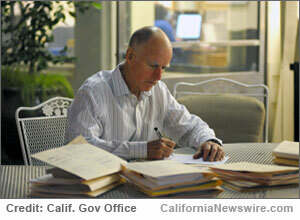 SACRAMENTO, Calif. /California Newswire/ — Today, Calif. Governor Edmund G. Brown Jr. announced the following appointments: First, Jim Zamora, 56, of Davis, has been appointed deputy director of communications at the California Department of Human Resources. Zamora has been senior communications specialist for the Service Employees International Union, Local 1000 since 2008. He was a news reporter at the San Francisco Chronicle from 2002 to 2008, where he was assistant regional editor from 2000 to 2002. Zamora was a part-time journalism instructor at San Francisco State University from 1999 to 2002 and a news reporter at the San Francisco Examiner from 1993 to 1999 and at the Los Angeles Times from 1990 to 1993. He was editor-in-chief at the University California, Berkeley Daily Californian from 1988 to 1989. This position does not require Senate confirmation and the compensation is $87,024. Zamora is a Democrat. Jeff Dominguez, 52, of Sacramento, has been appointed outreach and special projects coordinator of the California Exposition and State Fair. Dominguez has been operating manager at Angel Lynn Realty since 2014 and a freelance writer at Dominguez-Clark Communications since 1996, where he was managing partner and creative director from 1991 to 1996. He was a REALTOR(R) associate at Keller Williams Realty in 2014, a realtor at Francisco Cuellar Real Estate from 2012 to 2014, owner and manager at EXIT Realty West from 2007 to 2012 and manager and REALTOR(R) at Pacific Properties from 2003 to 2007. Dominguez was a sales representative and marketing manager at North American Title Company from 1999 to 2003, a realtor at Coldwell Banker, Dunnigan Company from 1996 to 1999, an assistant editor and columnist at Capitol Weekly News from 1994 to 1996, copywriter and project manager at Carter Hawley Hale-Weinstock’s Advertising from 1988 to 1991 and special unit staff writer at the Legislative Counsel of California from 1986 to 1988. This position does not require Senate confirmation and the compensation is $48,000. Dominguez is a Democrat. Henry Hansel, 67, of Santa Rosa, has been reappointed to the California Consumer Motor Vehicle Recovery Corporation Board of Directors, where he has served since 2013. Hansel has been owner and president at the Hansel Auto Group since 1973. He is chairman of the Ford Dealers Advertising Association of Northern California, president of the Northern California Toyota Dealers Advertising Association and a member of the Northern California Honda Dealers Advertising Association Board of Directors. This position does not require Senate confirmation and there is no compensation. Hansel is a Democrat.